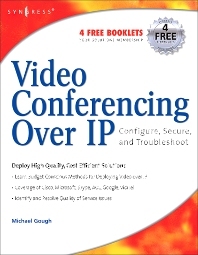 This book de-mystifies the technology behind video conferencing and provides single users and small enterprises with the information they need to deploy video conferencing efficiently and cost effectively. For many years, the promise of high quality, low cost video conferencing has been an attractive solution for businesses interested in cutting travel costs while maintaining the benefits of face-to-face contact. Unfortunately, most solutions never lived up to the promise, due primarily to lack of internet bandwidth and poorly developed protocols. That's no all changed. The capacity has been created, the hardware works, and businesses are more eager than ever to cut down on travel costs. For many years, the promise of high quality, low cost video conferencing has been an attractive solution for businesses interested in cutting travel costs while maintaining the benefits of face-to-face contact. Unfortunately, most solutions never lived up to the promise, due primarily to lack of internet bandwidth and poorly developed protocols. That's no all changed. The capacity has been created, the hardware works, and businesses are more eager than ever to cut down on travel costs.